We hold regular meetings in Colwyn Bay at our two venues, Pentre Newydd community Centre in Old Colwyn and our own purpose designed facility on Rhiw Road in the centre of Colwyn Bay. You can find directions for both venues on our 'How to find us' page. Mondays we hold a Ukulele & Singing practice session from 2:00 pm to 4:00 pm. You do not need to be an expert and you might just learn something. You are sure to have a lot of fun whatever happens. Tuesdays Woodworking session from 11:00am until approximately 3:00pm. Wednesdays Woodworking session from 11:00 am until approximately 3:00 pm. Wednesday Evenings Woodworking session from 7:00pm until about 9:00pm which has proved to be quite popular with a range of interesting projects ensuing. Other activities are arranged from time to time and details are usually notified to members directly. 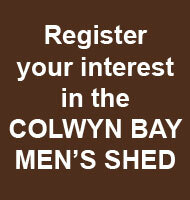 Thursday is reserved for She-Shed activities. This is a relatively new venture where women can come together in the way that men already do. More details here. Please note: All finish times are approximate and may vary depending on activities and availability of volunteers. Friday morning have become very much a social gathering for us. We started life in Old Colwyn and continue to hold meetings there as there is not enough space at Rhiw Road for the 15 to 20 members we have attending each week. We have occasional speakers on Fridays on a wide range of topics of interest to members. Even when we don't have a speaker, attendance is very good as the lads always enjoy a good chinwag and pannad. The companionship felt by the members is tangible at these meetings and if you want to feel it, just turn up at 10 o'clock.